We organise a 5 day guided walking holiday with walks every day in different parts of Cornwall, walking mainly on the South West Coast Path in Cornwall with 7 nights accommodation based in Falmouth the maritime town of Cornwall. A Celtic country with stories of geological wonder, myths and legends, of a landscape that has given inspiration to many artists, writers and poets. A Unesco Mining World Heritage site and many Areas of Natural Beauty. Includes:- Packed lunches, transportation, CD ROM of photos of your walking week, Annual guidebook from the South West Coast Path Association, native tree chosen by you planted on our land in Cornwall. Walk at a leisurely pace of 1-1.5 mph between 6-9 miles (9-12kms) per day over the most spectacular scenery with me as your guide. 7 nights accommodation chosen by you from a comprehensive list of people we work closely with. 5 days of walks all around Cornwall to see the best paying close attention to your interests. the Lizard peninsula, which attached itself to Cornwall 375 million years ago and is unlike anywhere else in Britain. The Far west, Penwith, which is the land of Granite, myths and legends and archaeological features like stone circles and standing stones. The Roseland Peninsula, an area out of the way from the mainstream, with the quietest country lanes, old estates and wonderful bays and headlands. The craggy North Coast stretching from Lands end up to Padstow with high cliffs, long beaches and fabulous bays. I can assure you that you will get the best personal service, the accumulation of 30 years of my acquired knowledge and experience in both the guided walks and entertainment industries. But above all you will get an entertaining and informative insiders view of the most unique, mesmerising and beautiful area in the UK. Please feel free to contact me for a chat. I want you to have the best walking holiday ever. Your average walking day consists of being picked up at 9.15am in our 8 seater VW Caravelle (Ellie as named by our children). Depending on the weather and wind direction I will choose where we are walking for the day. So many times we have timed our walking day to perfection dodging the inclement weather. All local knowledge and some good weather watching works wonders. We are walking by 10.15/10.30am and walk leisurely until 4.30/5pm. Lunch is a real packed lunch consisting of a sandwich/roll (often with eggs from our own organically reared chickens) and up to 7 other snacks including three different fruits, energy bars, crisps, carrots, biscuits and cake. Special diets are catered for so we know when you fill out our information forms we send when you book. Cornwall's landscape is undulating and so we must stress that a certain level of fitness is required. You must be able to walk between 6 and 9 miles per day for five consecutive days. The walks are not route marches. For us it is the journey, not the destination. We stop, we take in the scenery and often we will do a five mile walk with a spot of swimming or beach gazing and scrambling. It's your holiday so like in my musical evenings, I do take requests. But in the main we walk 6-9 miles per day in different parts of Cornwall taking in the flora and fauna, myths and legends, maritime stories of wrecks and smuggling, anecdotes on mining and fishing and so much more. Looking for the DNA of Cornwall! The Cornish landscape does it's own talking. We know when to be quiet and when you just want to take it all in. Falmouth is the largest town in Cornwall at the mouth of the River Fal opposite St Mawes on the south coast. There are miles of beautiful wooded creeks, beaches, estuaries and sea front. Falmouth also boasts International entertainment at the Falmouth Pavilions, a wonderful Maritime Museum, numerous art galleries and around 40 restaurants. Falmouth is the perfect town to stay in. 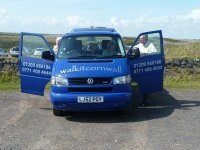 Cornwall Guided Walks are from Monday to Friday. Stay Saturday or Sunday to Saturday or choose your dates. If we can get a group together of 4+ on any other week of the year then ask and we might be able to put on a walking week for you. Sat June 1st Cornwall guided walking holiday based in Falmouth 7 nights/ 5 days of walking. Our Cornwall page. 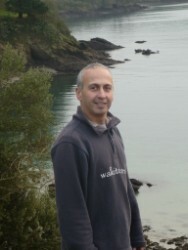 Cornwall guided walking holiday based in Falmouth 7 nights/ 5 days of walking. Our Cornwall page. 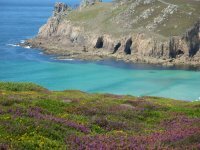 Sat June 22nd Cornwall guided walking holiday based in Falmouth 7 nights/ 5 days of walking. Our Cornwall page. 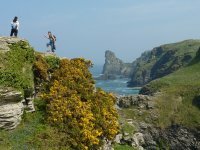 Sat June 22nd Sat June 29th Cornwall guided walking holiday based in Falmouth 7 nights/ 5 days of walking. Our Cornwall page. 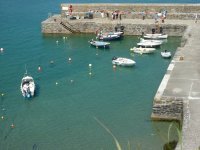 Sat July 13th Sat July 20th Cornwall guided walking holiday based in Falmouth 7 nights/ 5 days of walking. Our Cornwall page. Sat Aug 3rd Sat Aug 10th Cornwall guided walking holiday based in Falmouth 7 nights/ 5 days of walking. Our Cornwall page. CORFU Walking week - 9 nights 10 days of walks and trips. See dedicated CORFU page and ask for a detailed pdf brochure to be sent. New extended holiday with day trip to Albania.